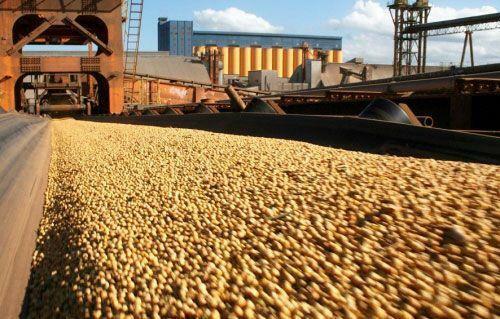 Brazil's soybean production and harvest is anticipated to hit record numbers this year, but concerns are now being raised about where the beans will be stored. This year's production is anticipated to increase 18 percent over last year's crop, but storage has not increased with it. Farmers are for the first time also seeing a decline in prices, further influencing their decisions to hold on to old crop as well as new crop from the current harvest. Other methods of storage including ground and plastic bags are providing alternative methods for famers, but the question remains: where will these bushels go? Soybeans continue to remain in the news in China as well. In China, beans are also piling up at Chinese ports as very large imports continue. The Chinese government changed some of the policies for it's quarantine procedure, meaning that beans need to sit in warehouses at the port for longer than usual periods, blocking shipments from being unloaded. That, combined with a change in tax policy is causing several million tonnes of beans to sit on cargo vessels at anchor off the coast of China. After President Trump declined multilateral trade deals with both the EU and Japan, the two are now searching for alternative markets to trade and sell. Currently, the EU and Japan are in the middle of negotiating a trade deal of their own with highlights on the dairy and auto industries.Thursday July 6, Ministers from Japan and the EU are anticipated to announce a formal deal between the nations. Another take on the Japan-EU trade agreement, with a little more background on the Geographic Indicator issues. Flooding in the Chinese province of Hunanhas killed 56 people and caused 4 billion dollars worth of damage already, with the rains expected to continue. Hunan is a large crop producing region and has gotten hit hard with the recent severe weather. As Washington fights to get a fiscal year 2018 planned, the House Appropriations Subcommittee for Agriculture, Rural Development, Food and Drug Administration, and related agencies, are one step closer to pushing through a budget for the USDA. The bill pushed through by the committee will eliminate $1.1 billion, just a 5.2 percent difference from FY 2017. Also aligning with the budget is President Trump's plan to tackle three big challenges during his presidency; one of which includes infrastructure. After the President's speech in Cedar Rapids, Iowa, plans for improving rural broadband and internet access were announced. While the proposed plan is a much needed one for many parts of rural America, the implementation of such is not as easy as everyone had anticipated. Finally, the USDA released final numbers for Maine's 2016 Wild Blueberry production, the state's number one agricultural crop, stating production was increasing marginally, but values were not.